Visibility when snowplowing is key to efficiency and safety. The BOSS Snowplow makes it easy for you to see even on the darkest, nastiest of nights with our SmartLight2 headlight system. The system is designed to make it easier to see wider, farther and with more consistency. While the BOSS SmartLight2 system does offer a vise-like mounting grip to keep the lights in alignment, it is a good idea to check your alignment from time to time to make sure the headlights are properly aimed. This video provides a how-to-guide on aiming your snowplow headlights in addition to step by step instruction guide also listed below. Remove ice or mud from under fenders. See that no tire is noticeably deflated. Check vehicle springs for sag or broken leaves. See that there is no load in the vehicle other than the driver. Check functioning of any “level-ride” controls. Clean lenses and aiming pads. Check for bulb burnout, broken mechanical aiming pads, and proper beam switching. 4. Mark (or tape) the vehicle centerline of the headlights and the vehicle itself on the screen. 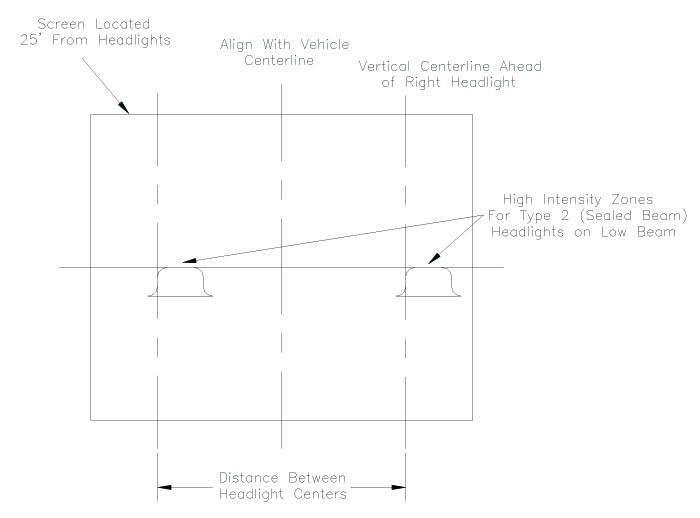 Mark the horizontal centerline of the headlights on the screen (distance from ground to headlight centers). The correct visual aim for Type 2 headlights is with the top edge of the high intensity zone of the lower beam below the horizontal centerline and the left edge of the high intensity zone on the vertical centerline. See diagram below.